I love a well-made dish of mashed potatoes, filled with good fresh butter and cream. Of course, my long term health, could do without a bit of that butter and cream, and so I love dishes, like this carrot puree, that can give as much (albeit slightly different) satisfaction with a bit healthier spin. This recipe for carrot puree can easily be modified to just about any similar vegetable, and once you master it, can easily swap out celery root, parsnip, cauliflower….a ton of other veggies. A side benefit is the absolutely beautiful color the puree brings to the plate, which I guarantee will impress your friends. Hope you enjoy it! You can certainly use 100% carrots in this recipe, but I find that flavor a bit too strong, and some potato helps to balance out the flavors. Pulse the food processor several times to combine everything, and continue with slightly longer pulses until pureed. 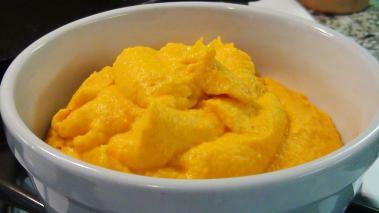 I really love to serve this carrot puree with pork and with fowl like chicken and duck, but it will go well with just about anything. Do-it-yourself muffins are an ideal fast breakfast answer or healthy snack to take to work for break time. There are many tools for example auto-form fillers to assist you particularly in registering together with the web survey organizations. Use free email accounts to register. Make good use of them as you must join with as a lot of them as possible. The trade secret of all successful survey takers is this - they have been members of hundreds to a large number of market research companies. Hello to all, it's actually a nice for me to pay a visit this website, it includes helpful Information.